If you live in the U.S. or Canada, Facebook doesn't just 'like' you -- it loves you. If you live in the U.S. or Canada, Facebook (FB - Get Report) doesn't just "like" you -- it loves you. Facebook, which has 219 million monthly active users and 169 million daily active users in those two countries, generates the most advertising revenue from the region. In the fourth quarter, a typical user from the U.S. or Canada generated $13.54 worth of revenue for Facebook, compared to $9 in the fourth quarter of 2014, an increase of slightly more than 50%. For the full year, users in this region generated $41.65 worth of revenue for Facebook, blowing away any other region in the rest of the world. 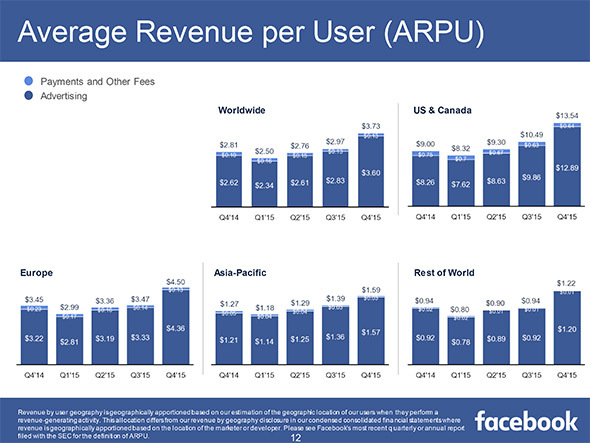 While the U.S and Canada generate the most average revenue per user (ARPU) for Facebook, the Menlo Park, Calif.-based company is seeing accelerating growth across the globe when it comes to generating revenue from its users. Facebook is a holding in Jim Cramer's Action Alerts PLUS charitable portfolio. "[T]he move up in Facebook's stock this morning makes a ton of sense, given that this quarter may be the single best quarter anyone has ever seen," Cramer said. "It ticked off every box that stock buyers want to see." You see Jim Cramer on TV. Now, see where he invests his money and why FB is a core holding of his multi-million dollar portfolio. In Europe, an average user was worth $4.50 during the fourth quarter, up from $3.45. In the Asia-Pacific region (which excludes China since Facebook is currently banned in China), a user is worth $1.50, up from $1.27 a year ago. In the rest of the world, an average user generated $1.22 in revenue, up from 94 cents a year ago. Signs like these, plus comments from CFO David Wehner indicating that the favorable trends are likely to continue into 2016, caused several analysts to raise their price targets on Facebook. Taken together, they highlight the fact that Facebook's future is extremely bright. But it all starts with you, the user.